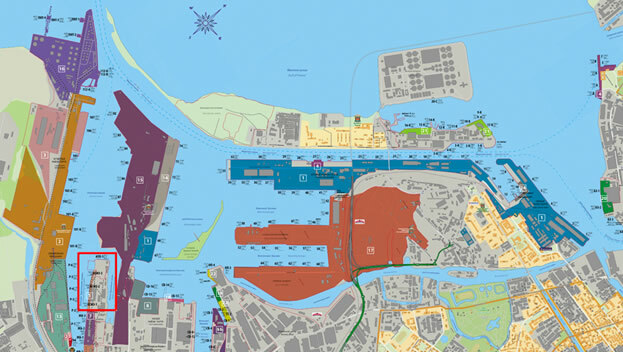 For sale is a territory of 11.651 ha located in the sea port ‘Big Port St.Petersburg’ for stevedoring purposes (the territory of Open-Joint Stock Company The Baltic Ship-Mechanical Plant). The price for the offered area is $150 million. The price can be lowered in the course of negotiations. This territory used to be the sight of the Baltic Ship-Mechanical Plant (BSMZ) founded in 1951. After the Plant had closed down in December 2006 the territory was bought to develop stevedoring. The territory is located close (4.5 km) to the Western Rapid Diameter motorway which will be fully put into operation in August 2016. As investors ask about the possible ways to develop the territory, we suggest two examples as basic variants for usage of the territory of 11,651 ha located in the sea port ‘Big Port St.Petersburg’ and offered at a price of $150 mln. On the territory one can build a transshipment complex for light, heavy or light and heavy oil products with capacity of 5 mln tons per year; or one can build a container terminal with capacity of 500,000 TEUs/year which can be enlarged up to 1,000,000 TEUs upon acquiring additional territories (dry port). Tanks with oil products are delivered to their routes by rail from the railway station “Avtovo” directly to the transshipment complex for oil products. The distance from the station to the transshipment complex is 2.5 km. Preliminary project studies of OOO Indid Project (St.Petersburg) have shown that within 24 hours the complex can receive the necessary 4 routes of oil products 64 tanks each (see the plan of the plan of the Oil Product Transshipment Complex below). One route leads to two double-sided railway overpasses for unloading that are equipped with systems for circulation heating and unloading of fuel oil 36 tanks each. If new batches of oil products arrive while the others are still being unloaded, the new batches will be placed on the utility railways of the terminal which can accommodate up to 128 railway tanks (2 routes 64 tanks each). One more route for oil products can be placed on our own 1.1 km long access railway. Thus, in 24 hours the complex can receive 15,360 tons of oil products whereas it is enough to receive just 13,700 tons a day to achieve the mark of 5 mln tons of oil product transshipment per year. 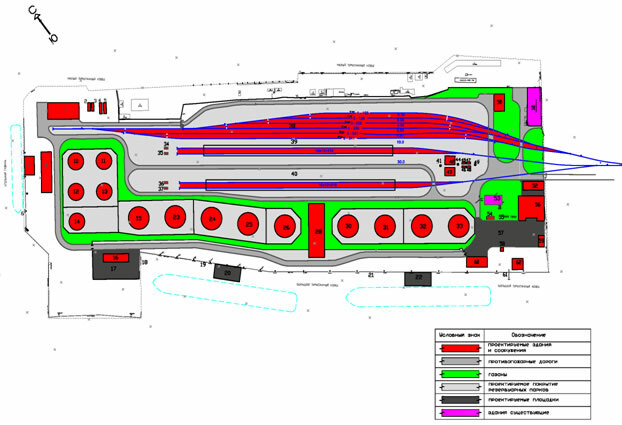 The terminal can also accommodate an oil depot receiving barges (5,000 – 6,500 tons) for water to land transshipment of oil products. As described above oil products are unloaded on two double-sided railway overpasses for unloading that are equipped with systems for circulation heating and unloading of fuel oil 36 tanks each, this allows to unload one route of oil products in 1.5-4 hours (depending on the type of fuel and the time of the year). Unloaded oil products go to storages – tanks, their total volume can vary from 110 to 140 thousand m3. Due to such storage volume the complex can provide not only the services for reception and shipment of oil products but also their storage. Shipment of oil products from storages and shipping them to other ports is carried out on a wharf wall 500 m long. Two shipping tankers with dead-weight of 30 – 39,000 tons can be unmoored at the same time if the bottom is dredged to -12m line. At the moment the depth by the wharf wall is -8.3 m. The bottom-dredging operation is estimated to enhance 400,000 m3, the estimated cost is from $2.5 to 4 mln. Standard loading time for a shipping tanker with 30,000 tons deadweight is 30 hours. Technical capacities of the terminal allow to ship 24,000 tons of oil products every 24 hours with a daily norm of 13 700 tons needed for the annual transshipment turnover of 5 mln tons. Let us elaborate on the price for the offer by making the following estimations. If you buy the territory for the offered price of $150 mln and additionally invest around $80 mln to build the complex, your total investment will be $230 mln. Introduction and usage of modern technologies in the work of the complex will allow you to set the prices for transshipment of oil products at the level of competitive terminals of the Baltic States, where prices vary from $13 to 16/ton for transshipment of light oil products and $16-18/ton for heavy oil products. Using the existing infrastructure of the territory and providing good management, the margin for transshipment services of oil products on the terminal can be $10 for each ton of transshipped oil products. Thus, the estimated annual profit will be around $50 million. Apart from its main transshipping activity the terminal shall also provide other services such as storage and fueling of vessels which can bring the approximate annual profit of $5-10 million. As a result the total annual income will be $55-60 million. Thus, after 7-8 years of operation the total profit from the main activity of the terminal will amount to $385-480 mln. This means that the total profit will be over two times higher than the initial investments of $230 mln. The information provided shows that if one invests $150 mln in the purchase of the territory and $80 mln in construction of the complex which, if it has the annual profit of $60 mln, after 7-8 years of operation will reach $615-710 mln in market capitalization, where $230 mln are the initial investments and $385-480 mln will be the accumulated profit. Containers with either export or import freight can be delivered either by sea, river, rail or road. These means of delivery are available due to a very good location of the territory and its transport accessibility as it is close to the ring road (1.2 km) and to Avtovo railway station (2.5 km), and its own access roadways and railways. 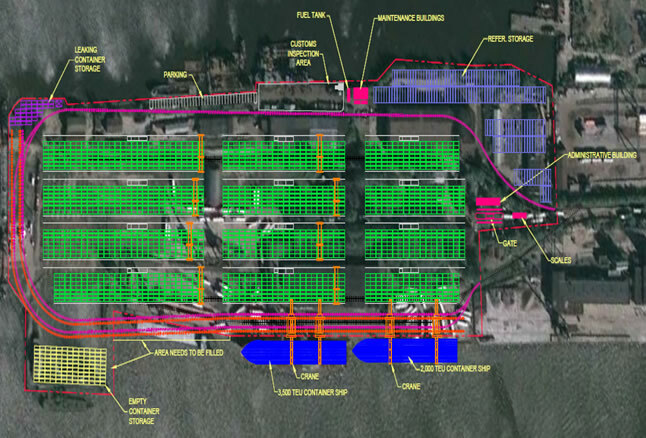 According to a preliminary project survey carried out by Tetra Tech company the territory in its current scale provides for the terminal maximum capacity of 10,400 TEUs and 465 refrigerated containers which allows to handle 500,000 TEUs annually (see Plan of the Container Terminal below). To reach this level the average daily transshipment volume has to be not less than 400 TEUs. Two types of vessels – 3,500 TEUs and 2,000 TEUs – can be loaded/unloaded simultaneously at the quay wall. According to international norms it takes around two minutes to load or unload a 20- or 40-foot container; the available infrastructure will provide for the full announced annual freight turnover if the bottom is dredged to -12m as the draft of both types of vessels is 11m. Dredging works are estimated to amount to 400,000 m3. The approximate price of the works will be from $2,5 to 4 mln. One should mention that the available capacities can be expanded up to 1 mln TEUs/year upon acquiring additional territories (dry port). ДLet us elaborate on the price for the offer again by making the following estimations. If one buys the territory at the offered price of $150 mln and make additional investments of about $100 mln to build the terminal, the total amount of investments will be approximately $250 mln. Due to infrastructure available and usage of modern technologies, one can set the price of $250 for 1 TEU for cargo handling at the terminal (the average rate at container terminals of the Ust-Luga container terminal, Global Ports in St.Petersburg and MOBY DIK in Kronshtadt is around $285/ 1 TEU). This is a competitive rate even in comparison to the terminals in Western and Northern Europe. With this rate the annual estimated proceeds will be around $125 mln. With a margin of $115 from each container and the annual freight turnover of 500,000 TEUs the complex will have the annual profit of $57.5 mln. Thus, after 7-8 years of operation the total profit from the main activity of the terminal will reach from $402.5 to 460 mln which is almost two times more than the investments of $250 mln. Loading and unloading of containers transported by containerships, short-term storage in storage area and following transportation by road. The information given above shows that in 7-8 years of operation of the complex $150 mln investments in the purchase of the territory and additional $100 mln investments in construction of the container terminal, provided that it has the annual profit of $60 mln, will bring it to $652.5-710 mln in market capitalization, where $250 mln are the initial investments and $402.5-460 mln will be the accumulated profit. Thus we see that the projects provide for a swift return of invested means and high profitability, proving its investment prospects. Although the span of stevedoring activity shall on the territory is broader than the given examples. One can organize here transshipment of bulk cargoes (coke, mineral fertilizers), dry bulk cargo (grain, sugar), general cargoes (incl. metal), petrochemical products (liquid and dry), and sulfur. Moreover, a RO-RO terminal can also be built on the territory.